Rambam’s view was that only undisputed matters in the Gemara can be said to have been received from Sinai; anything about which there is dispute is ipso facto not received from Sinai. How on earth could R. Schmeltzer be citing Rambam in support of the view that both sides of a disputed matter are from Sinai? As cited by R. Schmeltzer, it sounds as though Rambam is saying that one should not think that disputes in the Gemara are due to errors in transmission from Sinai or intellectual shortcomings, and that one position in a dispute is false. The inference is that all Chazal’s statements are true, and all reflect an accurate transmission from Sinai of unique permutations. In other words, Rambam is saying that one should not think that in a dispute, one view is not from Sinai; they are both from Sinai. החלק השלישי, הם הדינים שנלמדו באחת המדות, ובהם נופלת מחלוקת כמו שאמרנו, ונפסק בהם הדין כדעת הרוב לפי הכללים שהקדמנו, במה דברים אמורים כשהדבר שקול, ולכן אומרים אם הלכה נקבל ואם לדין יש תשובה. ולא תפול מחלוקת ומשא ומתן אלא בכל מה שלא שמענו בו קבלה, ותמצאם בכל התלמוד חוקרים על דרכי הדין שבגללם נפלה מחלוקת בין החלוקים ואומרים במאי קא מיפלגי, או מאי טעמא דר' פלוני, או מאי ביניהו, כי יש שהם הולכים בדרך זו בענין זה במקצת מקומות ומבארים סבת המחלוקת ואומרים שפלוני סומך על דבר פלוני ופלוני סומך על דבר פלוני וכיוצא בזה. אבל סברת מי שחשב שגם הדינים שיש בהם מחלוקת קבלה ממשה, ונפלה בהם מחלוקת מחמת טעות בקבלה או שכחה, ושהאחד צודק בקבלתו והשני טעה בקבלתו, או ששכח, או שלא שמע מרבו כל מה שצריך לשמוע, ומביא ראיה לכך מה שאמרו משרבו תלמידי שמאי והלל שלא שמשו כל צרכן רבתה מחלוקת בישראל ונעשית תורה כשתי תורות, הנה זה חי ה' דבר מגונה ומוזר מאד, והוא דבר בלתי נכון ולא מתאים לכללים, וחושד באנשים שמהם קבלנו את התורה, וכל זה בטל. והביא אותם לידי השקפה נפסדת זו מיעוט ידיעת דברי חכמים הנמצאים בתלמוד, לפי שמצאו שהפירוש מקובל ממשה וזה נכון לפי הכללים שהקדמנו, אבל הם לא הבדילו בין הכללים המקובלים והחדושים שנלמדו [בדרכי העיון]. אבל אתה אם תסתפק במשהו ודאי לא תסתפק במחלוקת בית שמאי ובית הלל באמרם "מכבדין את הבית ואח"כ נוטלין לידים" או "נוטלין לידים ואח"כ מכבדין את הבית", שאין אחת משתי הסברות מקובלת ממשה ולא שמעה מסיני, וסבת מחלוקתם כמו שאמרו שאחד מהם אוסר להשתמש בעם הארץ והשני מתיר, וכן כל הדומה למחלוקות אלו שהם סעיפי סעיפי סעיפים. As can be clearly seen when the text is studied in its entirety, and even more obviously in the superior translation, Rambam is saying that any halachos which involve dispute were not received from Sinai. When Rambam later says that one should not think that in a dispute, one view is correct and one view is false, his point is that one cannot say that such a dispute is regarding the truth of a law transmitted from Sinai; instead, such a dispute is regarding a law derived by the Sages via sevara, about which the understandable limitations of the human intellect will lead to disagreements; in the case of Shammai and Hillel, only a few disputes, but with their weaker disciples, many such disputes arose. Rambam’s view is that in a dispute, one should not think that one view is false, i.e. a perversion of that received from Sinai. R. Schmeltzer presents an edited version of the text which implies that both sides of a dispute are accurate representations of the tradition from Sinai, but clearly Rambam’s real position, as seen from the full text, is that neither is intended to represent a received tradition from Sinai. (1) ומהם פירושים מקובלים מפי משה, ויש להם רמז בכתוב, או אפשר להיות סוברים עליהם סברא. (2) ומהם הלכה למשה מסיני. (3) ומהם מה שהוציאו בדרך הקש וסברא ובו נפלה המחלוקת. Halevay that others would adopt such intellectual honesty. It is shocking, utterly shocking, to see a rabbi actually edit the words of Rambam - in the previously discussed case, even rearranging his words!!! - so as to fundamentally distort Rambam's view in support of his own agenda. The claim that every position on a given issue taken in the gemara is true (or, as put here, from Sinai) is quintessentially non-rationalist. It takes a convoluted line of logic to argue that when Rav Reuvein says its white and Rav Shimon says its black, they’re both right. I can understand saying that both are Torah: both opinions are trying to understand something in the Torah, and thus both are worthy of study. But to say that two opposite, mutually exclusive opinions can be the literal truth flies in the face of common sense. "The claim that every position on a given issue taken in the gemara is true (or, as put here, from Sinai) is quintessentially non-rationalist." Why are you equating "from Sinai" with "true"? Obviously, the whole point of the statement is to try to deal with the non-rational aspect of machlokes. Whether it succeeds or not is another question, but it seems pointless to reword it in a way which makes it automatically absurd. R Slifkin from your posts so far it seems to me this "sefer" you are responding to is so poorly researched and even deseptive that I do not understand why you are taking the time to even respond! Does anyone take this sefer seriously at all? > Why are you equating "from Sinai" with "true"? Don't we assume that anything said by God at Har Sinai is by definition Dvine Truth? Not at all. It keeps us from hiding behind imprecise terms and forces us to deal with what we are really saying. I agree with ephraim. The issue at hand is not whether the two opinions in a Gm' dispute are true. In fact the Gm' says "Eilu v'eilu divrei Elokim chaim" - both opinions are true as they are the "word of the living G-d". This means both can be true because, as the Rambam explains, both are derived from the basis of the mesorah from Sinai and use the rules of svara and exigesis properly. So both are academically true, although we may adopt one view halacha l'maaseh according to the dictate of "achaerei rabim l'hatos". The issue R. Slifkin is dealing with is the assertion of R. Shmeltzer that both divergent opinions were received as part of the mesorah from Sinai. In other words, they are because the argument goes back to Sinai. The Rambam clearly says this is not the case because anything from Sinai has no argument. "So both are academically true, although we may adopt one view halacha l'maaseh according to the dictate of "achaerei rabim l'hatos""
This is not the Rambam's approach to halacha l'maaseh when the Sanhedrin is defunct. Though 'achaerei rabim l'hatos' may have been the operating principle motivating the decisions of other decisors such as the Mechaber (who committed himself to follow the majority between Rambam, Rif and Rosh) it was not the method employed by nor prescribed by the Rambam. Whichever sevara is more logically compelling, then that is the side to be followed (למי שהדעת נוטה לדבריו). There are not multiple truths - it would seem that (at least according to rationalists such as Rambam) the principle of logical non-contradiction is operative in the realm of halacha as well. Not all views are equally valid. For an interesting discussion of this issue you might be interested in Buchman's essay "Tradition! Tradition? Rambam and the Mesorah" in the latest issue of Hakirah. I don't see why one should be surprised at the notion of taking something that is poorly researched or deceptive seriously. 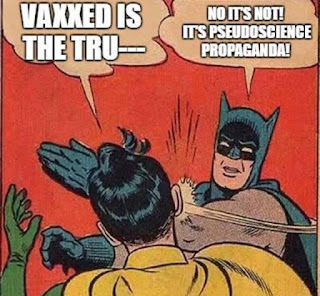 There are plenty of poorly researched, as well as deceptive works that are taken seriously. Look no further than Lawrence Keleman, Avigdor Miller, Dovid Gottlieb, Tzvi Inbal, Rabbi Belsky...etc and what they have to say about evolution. And yes, there are actually people actually take them seriously. I used to be one of them. > This means both can be true because, as the Rambam explains, both are derived from the basis of the mesorah from Sinai and use the rules of svara and exigesis properly. That both positions are derived through valid exegesis is allows one to reasonably say that both are worthy of study as Torah, but not that both are true. > So both are academically true. That’s sophism. Something either is or is not. Again, two mutually exclusive positions cannot both be true. Something cannot be both entirely white and entirely black. Even if “academically” arguments can be brought for both positions, ultimately reality dictates that one is right and one is wrong. > The issue R. Slifkin is dealing with is the assertion of R. Shmeltzer that both divergent opinions were received as part of the mesorah from Sinai. Operating on the assumption that the mesorah comes from God, and that God is all-knowing and always truthful, this is logically ridiculous. The implication of the claim is that, despite knowing the actual color of the object, God told Moshe that He wasn’t sure if it is black or white, and different groups chose to champion each position. A far more likely explanation is that the claim that both opinions were received at Sinia is a post hoc explanation for why there are arguments in the supposedly perfect mesorah, and an attempt to deny the obvious: that the mesorah was partly or wholly forgotten, or worse, arose independently of Sinai through millennia of exegesis and layers of commentary. Halacha is not about true and false. Regarding a particular matter, there could be multiple considerations, all from the Gates of Wisdom which Moshe received. If one consideration is judged to prevail, that does not invalidate the others. Halacha arises from a system of interfering principles. Like the grammar of a particular natural language arises from interfering principles of universal grammar that are built into our minds. A particular halacha, or a particular fact of reality, could easily be at apparent odds with a Divine wisdom. Bans of truth are not justified by such contradictions. An understanding may be "from Sinai" even if it is first conceived today. The big question is if indeed all of the Talmud is at the from Sinai level. There are quite some Talmudic discussions that tell me that this is not the case. "That’s sophism. Something either is or is not. Again, two mutually exclusive positions cannot both be true. Something cannot be both entirely white and entirely black. Even if “academically” arguments can be brought for both positions, ultimately reality dictates that one is right and one is wrong." If the law of non-contradiction can be broken with photons, then I'm not sure why it can't be broken with Torah. I was not discussing how the Rambam paskins halacha in the Yad; rather how the Rambam would understand how disputes exist in the Gm., how they both can be true, and how the Mishna / Gm. would decide the halacha according to the majority (in most cases anyway). I think you are making a fundamental mistake in how G-d would approach things. Yes we say God's "seal is truth", but we also have cases where G-d changed the truth (perhaps lied) . In addition G-d created the Universe and that includes the Satan and plenty of sheker. It would seem then that G-d can encompass both what we would define as truth and untruth. It would also seem that Emes is not properly defined as truth; rather Emes is better defined at that which is accordance with G-d's will as defined by the Torah. Thus G-d creates sheker and G-d can perhaps lie because that was the proper thing to do, according to G-d and Torah. As a result of this, there is no problem accepting contradictory opinions as Emes (perhaps not "truth") if they are properly based on Torah. In fact, the concept of eilu v'elilu doesn't say the word "truth" in it; rather "divrei Elokim chaim" - the word (=will) of the Living G-d. In the context of "eilu v'eilu", I just would like to point out that the biggest problem with almost all interpretations of this idea is that there simply is no sugya in Shas which can be learned with this in mind, unless we say that the Tannaim and Amoraim were totally hiding their real meaning from us. Nowhere in the Gemara do we find anyone saying, in effect, "I know your opinion is from Sinai, but so is mine, and I just like mine better." Just the opposite, in every dispute each side is stating quite clearly that the other side is wrong, whether because of misunderstanding a pasuk, an earlier source, or a s'vara. The most that we find, and even that often in its most minimal form, is a certain cordiality and respect for the other side. Often we find one side saying, essentially, "I don't quite consider you an apikorus or a plain am-ha'aretz, but in this case at least, you really missed the boat." This is all at least as true in the words of the Rishonim and Acharonim, down to this day. All this points, in my opinion, to some kind of interpretation of "eilu v'eilu" along the lines of "everyone who tries as hard as he can to find the truth is beloved by G-d", which of course has no particular philosophical significance as far as belief is concerned. Into this mix you can throw in the contradictory juxtapostion of "Elu Velu.." and "Lo Bashamayim Hee". E Hachi, if so, Lo Bashamayim Hee, does it really matter what Elu Velu is or is not? Its no longer Hashems business since the Torah was given to man, then how could it possibly matter to Hashem what the end result is since according to Lo Bashayim, we are not catering to Hashems agreement and Elu Velu is a nice phrase but if its meant as a way of saying that both have placated Hashem then you are wasting your time. Better your tayrutz placates the people at hand.